Nursery decorating comes easy to some, but to others not so much. Lament no longer and head to where the action is – Walter Silva makes coordinating your prints with your cushions and accessories a cinch at Society 6. It really is that simple. You can choose a Walter Silva framed art print that you fancy and then find it printed on a cushion or even a stretched canvas, in fact if you really love it you can find the same print on tees, onesies, note cards and tote bags, just to name a few. I won’t lie, it’s the easiest way for anyone lacking a natural decorator flair to coordinate your nursery accessories. 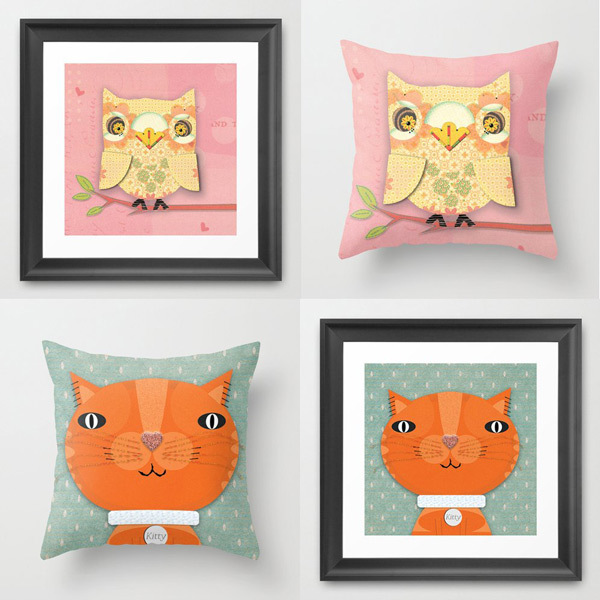 Walter has so many gorgeous artworks that can work in a child’s nursery including the cheeky Tabby Cat and Owl, both pictured here to anchors, giraffes and elephants. Prices are extremely reasonable with forty centimetre square cushions priced US$20 and framed art prints starting from $39. See the whole collection of gorgeous prints from Walter Silva at Society 6.